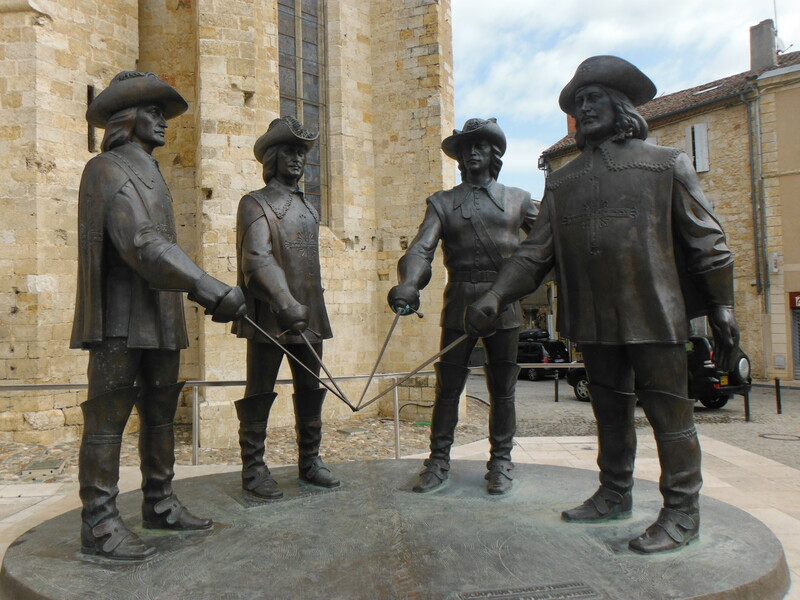 Nice pic of the Musketeers. Thanks! Who has been to Neuschwanstein Castle in Bavaria and is it worth it? I try to go to Europe for about three weeks every summer. I bet I know exactly where you are staying in Rome. Anyway, the best advice I can give you, BY FAR, is to make connections while you are over there and keep those connections! I am TOTALLY serious!! It doesn't matter what you do or where you go this particular year so much as it matters who you meet. When I was in college I had no way of knowing that. I won the lottery and am able to go to Europe every year and basically stay for free because of friends I made back when I was in school. Long story short, I was a soccer fan and back then almost no one else was. So, I made friends with a lot of foreign students both at X and at UC. We are still friends. I've made more friends who live in more countries through them and the time I've spent over there. It's to the point now that when I'm over there I don't even have time to see everyone. So, create that for yourself!! I NEVER would have even thought about going to Europe before college, and never would have gone had I not been talked into it by friends who wanted me to come visit. I always just went to the beach and got hammered. That was my idea of travel. I kind of want to go back in time and punch myself when I think back to how I almost didn't go, and how I'd had chances to go sooner and didn't. But, anyway, I lucked in to basically being able to have fantastic experiences every summer simply because of the people I met. You'll be in Rome. You'll be with people from a lot of different places. Ask them where you should go while you're there. They'll know better than just about anyone here would. And, without realizing it, you could be setting yourself up for awesome vacations for the rest of your life. Last edited by xubrew; 04-10-2019 at 10:02 AM. I knew so little about travel the first time I went, that I didn't even understand how passports worked. I thought it worked like a driver's license and that you just went to the post office and got one. I almost didn't make it over there after having booked the trip because I was so stupid about how I initially acquired my passport. I remember when Chris Mack's family had an issue going to the tournament in the Battle 4 Atlantis (I think), and everyone was up in arms about how they didn't know what the rules were. Well, I didn't know the rules the first time I went abroad either, and I was VERY close to having to eat the price of the plane ticket and miss out on the trip. So, I couldn't say anything. Just went there a few weeks ago. It’s a cool castle but they’re working on different areas of it. There’s 2 other castles nearby also. Füssen is a really nice town to stay in if you visit. Thanks for the tip. Fussen appears to have great history. We were thinking about a day trip to the castle from Strobl, but that looks like a 4-hour one-way ride and in December weather. Might have to rethink that one. I've been to the Disney Castle in Bavaria twice. Very nice, and I also second spending some time in Fussen (too lazy to figure out how to add the umlaut). In that area, a visit to Dachau is also a must from my perspective. It must be really odd to live in Dachau and have tourists cycling through your town to see the concentration camp. Even odder for the municipal bus drivers who are driving all the tourists from the train station to the camp. Sobering for sure, but worth doing. You'll appreciate the fine beer of Munchen all the more that evening after the visit. We went to Dachau the year we were over there studying. Very chilling and humbling experience. Munich is great, as you noted. The Hoffbrau House. Glockenspiel. We love Munich. Funny thing about the Hoffbrau House, given current events with the YTG. One night we were in there and a bunch of students from UCLA were in there, too. Imagine the German Uhm-Pomp-Pom Band dueling with a bunch of students belting out their Bruin fight song. Probably more of an Ugly American thing, now that I think about it. Imagine the German Uhm-Pomp-Pom Band dueling with a bunch of students belting out their Bruin fight song. Probably more of an Ugly American thing, now that I think about it. I enjoyed the Olympic Park in Munich as well. Not particularly exciting, but it's a nice green space. As a bonus, there's a large soccer stadium there that I believe is the home of Bayern Munich. And BMW's HQ is right outside the park. My wife grew up spending her summers in Lebanon, and has been to Europe so many times she has limited interest in going back. We do have a Barcelona to Lisbon cruise in the fall on a 300 person max cruise ship, so I’m looking forward to that. That’s a long way of saying, can’t help you, but pray you have a great and safe trip! I live in Lebanon. I’d recommend trying The Breakfast Club and Blackhorse Tavern. There is an outlet mall about 7 miles away near 75. The race track has closed and moved out to 75. Other than that...I got nothing.